Something that is happening with increasing regularity across today's mainstream media, is that regardless of what subject matter is being discussed, and despite the need today more than ever before for Americans to have access to accurate information that could prove vital for the safety and well-being of their families, almost without exception the information the mainstream media is providing as “real news,” is almost always woefully incomplete, or lacking any information that resembles news with an ounce of journalistic integrity. He who controls information, controls absolutely, and "The Powers That Be" have made sure that we the people do not have access to real information. Instead, what the mainstream media calls “real news,” is little more than sound bites and propaganda intended to keep the masses distracted and pacified. Those of us like myself who make an honest effort to spread the truth, have been labeled as “fake news,” and we are often censored or blocked for weeks at a time from getting our messages out. I know this, because I just spent the last two weeks banned from most of social media because I chose to reveal the truth about Facebook's new "Fact Checkers" (aka Snopes), a couple I've had frequent altercations with, but never lost to lose once. Before Charles Ochelli and Barry Prince from AmericanFreedomRadio.com interview the one and only Dr. Jim Willie, editor of the Hat Trick Letter, about the current state of the global economy, which focuses on many of the specifics you can hear other experts around the world warning about as well, in the first video below I give a summary of the information found in the article afterward titled, "America’s Economy Before Versus After Obama," which lays much the foundation for what Dr. Willie discusses. During the interview with Charles Ochelli and Barry Prince from AmericanFreedomRadio.com, Dr. Willie begins with a discussion around the massive divergence currently taking place between the price of paper gold contracts sold on the COMEX market, otherwise known as "paper gold," and the price for an actual exchange of large volumes of gold bars. The spread that exists between COMES "paper gold contracts" and actual physical gold bars is currently between an 80-90% premium, something Jim goes into great detail about. What does the price difference mean? It means gold and silver markets are artificially being suppressed, so you may want to reconsider if you're thinking about selling actual gold or silver in your possession. In an interview just days earlier titled: Dr. Jim Willie, the U.S. Dollar, and the Global Reserve Status – PART I and PART II, Jim explains how African style Zimbabwe printing of money the US has engaged in over recent years, along with the federal debt which has doubled from $9.99 trillion at the end of FY 2008 (September 30, 2008) to $19.95 trillion at the end of FY 2016(September 30, 2016), according to usgovernmentspending.com, should have people fleeing into gold, not out of it, so what's going on? Following both videos, is a breakdown of what the economy looked like before the Obama presidency, and after the Obama presidency, using figures from Obama’s own administration. The dishonest mainstream media wants you disbelieve your lying eyes and ears, and ignore the very numbers Obama’s own administration has published, numbers that reveal the terrifying truth. “The president said the U.S. ‘is indisputably better off’ because of him, and those who voted for Trump “are better off than they were when I came into office for the most part,” CNS News reported. Breitbart News put President Obama’s claim to the test using eight key metrics of economic health: the federal debt, the gross domestic product annual growth rate, the unemployment rate, labor participation rates, median annual income, home ownership rates, health care costs, and reliance upon food stamps. The two metrics which show nominal improvement–the unemployment rate and median annual income–come with significant caveats. While the measured unemployment rate has declined under Obama, the dramatic increase in the number of those not participating in the labor force, and stagnant median household annual income in real terms, suggest that those two economic metrics represent illusory gains. 1. The federal debt has doubled from $9.99 trillion at the end of FY 2008 (September 30, 2008) to $19.95 trillion at the end of FY 2016 (September 30, 2016), according to usgovernmentspending.com. That $9.96 trillion increase in Obama’s eight years is about equal to the $9.99 trillion in debt racked up in the 219 years from the founding of the republic in 1789 to 2008. Barack Obama has served since January 2009 and will be in office until this coming January. During Obama’s time in office so far, annual growth in real GDP peaked at 2.6 percent in 2015. The last year that real GDP grew by 3.0 percent or more, according to BEA, was in 2005, when it grew by 3.3 percent. Since then, the United States has gone a record ten straight years (2006-2015) without a year in which the growth in real GDP was at least 3.0 percent. In October, the Bureau of Economic analysis reported, “Real gross domestic product increased at an annual rate of 2.9 percent in the third quarter of 2016…In the second quarter, real GDP increased 1.4 percent,” and in the first quarter it increased less than one percent. All of Obama’s predecessors since John F. Kennedy, whose administration saw annual growth of real GDP peak “at 6.1 percent in 1962,” have seen far more robust economic growth. Even the relatively poor economies of the Jimmy Carter administration, which saw annual growth in real GDP peak “at 5.6 percent in 1978,” and George W. Bush’s administration, which saw annual growth in real GDP peak “at 3.8 percent in 2004,” did better. 3. The unemployment rate declined from 7.6 percent in January 2009 to 4.9 percent in October 2016. While the number of employed increased by 9.8 million and the number of unemployed decreased by 3.8 million, the number of Americans not in the labor force increased by 13.5 million while the civilian non-institutional population increased by 19.8 million. US unemployment rate fell to 4.9 percent in October 2016 from 5 percent in the previous month and in line with market expectations. The number of unemployed persons was almost unchanged at 7.9 million while the labor force participation rate decreased by 0.1 percentage point to 62.8 percent. The number of job losers and persons who completed temporary jobs declined by 218,000 over the month to 3.7 million. The number of long-term unemployed (those jobless for 27 weeks or more) was unchanged at 2.0 million in October and accounted for 25.2 percent of the unemployed. Both the labor force participation rate, at 62.8 percent, and the employment-population ratio, at 59.7 percent, changed little. These measures have shown little movement in recent months, although both are up over the year. 4. The labor participation rate has declined from 65.8 percent in February 2009, according to tradingeconomics.com, to 62.8 percent in October 2016, according to the Bureau of Labor Statistics. 94,333,000 Americans were not in the labor force in July, a slightly better showing than June’s 94,517,000; and the labor force participation rate improved slightly, increasing a tenth of a point to 62.8 percent from June’s 62.7 percent, the Labor Department’s Bureau of Labor Statistics reported on Friday. In September 2015, the labor force participation rate dropped to 62.4 percent, its lowest point since 1977. The best it’s been since Barack Obama took office is 65.8 percent in February 2009, the month after Obama was sworn in amid a recession. The labor force participation rate is the percentage of people in the civilian noninstitutionalized population, age 16 or older, who are either working or actively seeking work. As noted by the Congressional Budget Office, the labor force participation rate reflects people’s decisions about the attractiveness of working or looking for work compared with alternatives such as attending school, caring for family members, or retiring. 5. Median household annual income has remained stagnant in real terms under Obama. When President Obama took office in January 2009, median household income, in nominal terms, was slightly above $50,000. According to Sentier Research, median household annual income in September, 2016, the most recent period for which data is available, was $57,616. While that shows an increase of about $7,000 in median household annual income in nominal terms during President Obama’s administration, when adjusted for the Consumer Price Index, real seasonally adjusted median household income (in September 2016 dollars) was about $57,500 in January 2009, virtually the same as it is almost eight years later. “In real dollar terms, the median annual income is 1.5% lower (-$884) than its interim high in January 2008 but well off its low in August 2011,” Sentier Research found. 6. The home ownership rate declined from 67.3 percent in the first quarter of 2009 to 63.5 percent in the third quarter of 2016, according to the U.S. Bureau of the Census. 7. Health insurance rates, both for employer-sponsored programs and Obamacare, increased significantly between January 2009 and November 2016. “In 2008, the average employer-sponsored family plan cost a total of $12,680, with employees footing $3,354 of the bill, according to Kaiser data. By 2016, the cost of the average employer family plan was up to $18,142 for the year, with workers picking up $5,277 of the tab,” as Time.com reported. “In 2008, high deductibles were the minority: 18% of covered workers had deductibles of at least $1,000, per the Kaiser Family Foundation . . .Fast-forward to 2016, and high-deductible plans have become standard: 51% of all covered workers, and 65% of workers in small firms, face deductibles of at least $1,000,” Time.com added. The benchmark silver plan — upon which federal subsidies are based — will cost an average of $296 a month next year. That figure is based on prices for a 27-year-old enrollee in the 39 states that use the federal healthcare.gov exchange, plus the four states and Washington D.C. that have their own exchanges. For 2016, the benchmark plan’s premium rose only 7.2%, on average, for the states that use healthcare.gov. 8. 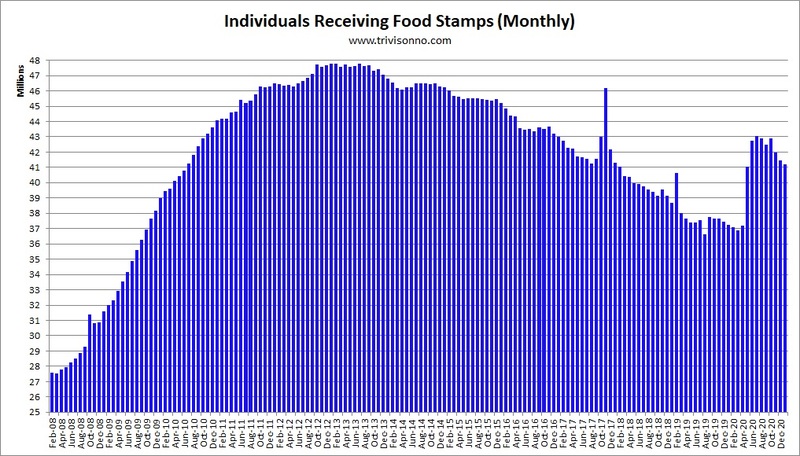 The number of individuals receiving food stamps increased from 32 million in January 2009, according to trivisonno.com, to 43.6 million in August 2016, according to the Food Research and Action Center, an increase of 11.6 million. Enrollment in the food stamp program — officially the Supplemental Nutrition Assistance Program — has soared by 70 percent in the years since President Obama first took office, a new report finds. The government said the recession ended in 2009, The Wall Street Journal reports, but enrollment in the food stamp program didn’t wane, as would be expected in an improving economy. Since 2008, it’s been on a steady rise, The Journal reports. A record 47.8 million people participate in the program, as of December 2012. With six of these eight economic metrics lower in 2016 than they were in January 2009, and with the two improved metrics qualified at best, it is hard to conclude that America is “indisputably better off” economically today–compared to January 2009. President Obama’s approval ratings continue to remain above 50 percent less than two months before he leaves office, a reflection of public sentiment concerning his personal style more than his performance on his job. By most objective measurements, most Americans are not “indisputably better off” economically after eight years of Barack Obama’s presidency. If most Americans really thought they were “indisputably better off” today than in January 2009, the media might be writing stories about President-elect Clinton rather than President-elect Trump in the final days of 2016. Previous Were RT And Drudge Taken Down So the Government Could Control the Anti-Russia Narrative?